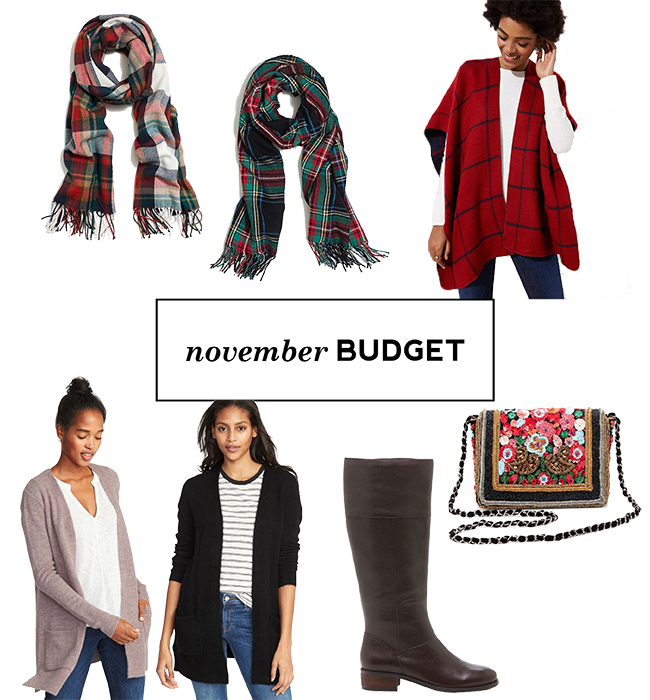 I feel like I say this every time I write a budget post, but how on earth is November almost over?! Between Thanksgiving and our trip to Hawaii, the month just flew by. As per the usual with months when we have a big trip, I didn't do a ton of shopping, mainly because I was checked out for so long! The scarves and cardigans I actually ordered back in October but they hadn't arrived in time for that month's post. My favorite purchase for the month is also the least practical - that pretty sequined handbag! Ever since seeing a friend carry a pretty beaded and sequined handbag to a wedding a few years ago, I've been on the hunt for something similar. It's such a fun and easy way to dress up a basic black dress (or just jeans and a tee)! I haven't brought it out to play yet, but I know it's something I'll have and use for years to come. J.Crew Factory Plaid Scarves - originally $29.50, on sale $20.65 x2. Yes, I now own six of these scarves, but they really are the best! Inexpensive but they don't look it, and they're nice and warm! I wear them both as a part of an outfit and with my coats as a warm layer. I get compliments every time I wear one. How fun is the red and green one for the holidays?! LOFT Cape - originally $79.50, on sale $39.75. I shared this cape yesterday, and it is so soft and so cute! Definitely a good buy for the holidays, and when reversed to the navy side, the rest of winter! Old Navy Cardigans - originally $39.99, on sale $27.99 x2. I ordered these when I was getting ready for a party back in October and realized I didn't own a black cardigan - what?! These are great dupes for the Madewell cardigans that are so popular right now (I have one in green) and feel surprisingly high quality for the price! I still might return the purple/gray color though - I feel like it isn't the most flattering color on my skin tone. Sole Society Boots - originally $149.95, on sale $127.46. I had these on my wishlist for a long time and was unsure on ordering them - mainly because I already had a couple pairs of riding boots, and since booties are more in style right now. But I ended up snagging them because I can't stand having cold winter ankles with booties all winter (Chicago problems!) and the day after they came my other favorite pair of tall boots bit the dust! I literally pulled the zipper right off of them!! So I'm very glad to have these now. They definitely won't work for you if you have a wider calf, they fit very close on me. I would also say they run slightly narrow, but wearing them around one day was enough to loosen them up for me. Sole Society Bag - originally $59.95, on sale $50.95. Like I said above, this is so cute in person and I'll be using it for years to come! It's a good size, big enough to fit both of my phones plus my other party essentials, and it has a chain that you can use to wear crossbody or on the shoulder, or you can tuck the chain inside and wear it as a clutch. So for December, I don't have a ton on my wishlist since I'm sticking to my maternity uniform (leggings, a tee shirt, plus another layer) through the end of February. I'll probably just be looking for a pair of winter shoes or boots that are easy to slip on for when it gets really hard to bend over, and another pair of maternity leggings! So tell me, did you budget in November? Get any good steals?